Discussion in 'PatsFans.com - Patriots Fan Forum' started by Redman443, Feb 6, 2019. I want us to get Kyler Murray. Just dunno if he'd want to pass on baseball to sit behind Brady and I don't see us trading up to get him. I think, as winner of the 2018 Super Bowl, we should get the first 96 picks in the draft, sort out 12 we want and release the rest back into the "Rest Of The NFL" draft. Seems appropriate considering all the personnel we've lost out on over the years because of the idiocy of the Goondell. Our record of picking WR's isn't very good, especially high in the draft...I'd steer clear early on and maybe go D line, lb or tight end early. Too bad no one bashed him over the head with the Lombardi. I definitely would have said LB at the beginning of the season but surprisingly it's better than expected. KVN has been great, we get Bentley back and Hightower actually looked like a good NFL player during the Super Bowl. It'd be good to get more depth in this unit but I'm okay with these guys going forward. TJ Hockenson, if available and assuming we don't trade down, should be our first round pick regardless of whether Gronk retires or not IMO. Agree with this for the most part. LB is no longer a priority, and TE is a high priority. Fortunately this seems to be a good year to go after a TE in the draft. I think Cooks is soft. He drops the touchdown pass (remember David Tyree? ), and does not fight on the Gilmore interception. Don't need guys like that - we need competitors. On the flip side, he was wide open for a TD and Goff should have hit him earlier. He also put up 120 yards and the DBs had to respect his speed. I agree that I don't want Cooks as my #1 option, but remember that we never got to see him paired up with Edelman. Ask yourself if Cooks would have done better than Hogan as the #2 option, and I think it's clear why a guy with his skillset would be a great pickup. If they don't re-sign Trent Brown, they have to go T yet again in the first round. I don't trust Wynn since we haven't seen him do the job. La'Adrian Waddle is a UFA, so they should resign him as a backup. He's not a starter by any means. If they do come to terms with Brown, I think Belichick goes DT/DE this year at #32 - If BC's Zach Allen is there, they should grab him. Good run stopper, good pass rusher, versatile defensive lineman. He smart - All ACC Academic Team. Just the kind of kid they need. The other guy on my list is the MLB from Clemson - Tre Lamar. Decent size (6'3" 250) and great speed, and projected 2-3 rounder. Another guy who can drop into coverage and play from a down position to rush the passer. Reminds me of Kyle Van Noy. I love Lamar. He's a big, strong kid who would look great in our corp. I feel the same way about D'Andre Walker (my comp for Van Noy; I think Lamar is more of an inside guy). If we don't re-sign Brown, OT will become the highest priority for the first two rounds, perhaps along with QB. WR may be a priority by then, but expecting us to do well with a highly drafted WR is a really wild dream. We are likely to sign 2-3 WR's, sign a couple of WR's in the draft later (so, sure, a high draft priority) and then trade for a WR. Oh my sweet summer child. You would think, from perusing the SteelerFury website with their fixation on alleged Patriot cheating, that Belichick and company would have long ago resorted to such a tactic. Tackles, particularly left tackles, take time to develop in the NFL. I do not think anybody should trust a virtual rookie to protect the bind side of the 42-year-old TFB. The move by Belichick to bring in Trent Brown as part II of the Jimmy G trade after deciding to move on from Nate Solder has not been celebrated enough. Trent Brown was superb. Lots of people were worried that fat Trent Brown would struggle mightily. One issue with doing it this way is that you lose the ability of Tom to directly mentor the young QB. 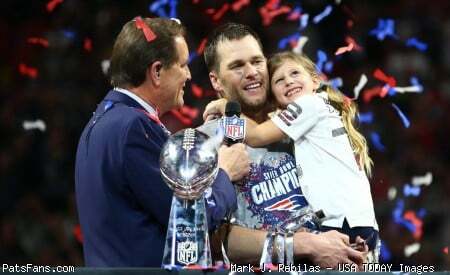 I think it's big for a young QB to experience Tom's greatness, approach to the game, approach to film, etc. in real time rather than Tom in an advisory role after he retires. That's assuming Tom agrees to be an advisor or QB coach or something. I don't think he will. We saw how he was threatened by Jimmy G. I just think he's too competetive to be come his own caretaker for the position while they groom the next guy. Weird, CBS Sports has a new story on possible 2019 Pats draft needs but doesn't list or mention the 2 3rd round comp picks the Pats have, sloppy reporting. Strictly speaking, they won't have them until the Combine. Nice crop of DT’s and TE’s this draft class. If Hockenson is available it’s gonna be hard not to the pull the trigger on him, regardless of team needs. If McCourty retires, I'd look at signing Earl Thomas. Need a receiver. Lots to choose from in the draft. We drafted Brown's replacement last year. It's still a need as he's not proven but not the top priority. Neither is QB unless 2019 is planned to be Brady's last year. WR, TE, DL (unless Flowers and one of Brown/Shelton re-signs). If we draft an OT in the first round I'll be very disappointed. Depending on FA we will have far bigger needs. When are you thinking? He should be available for our 2nd second, or even in the 3rd.